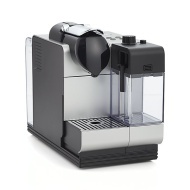 alaTest has collected and analyzed 57 reviews of DeLonghi Lattissima+ EN 520.SL. The average rating for this product is 4.7/5, compared to an average rating of 4.4/5 for other products in the same category for all reviews. Reviewers are impressed by the size and performance. The design and maintenance are also appreciated, whereas many are critical about the reliability. We analyzed user and expert ratings, product age and more factors. Compared to other products in the same category the DeLonghi Lattissima+ EN 520.SL is awarded an overall alaScore™ of 86/100 = Very good quality. Makes great espresso and lattes! Easy! Should have bought this years ago. Makes a great cappuccino or espresso. Goodbye Starbucks. Spoil yourself with this addition to your kitchen! I have had this for about two months and am enjoying it very much. The combination of brewing and frothing simultainiously is fabulous. Absolutely love the convenience. No fuss, no messy coffee grounds to deal with. Best of all the coffee tastes amazing. So easy to fix yourself a quick Latte or Cap. Love, love, love it!! easy to use and clean, excellent espresso with excellent milk froth, absolutely no complaints.